As part of Montgomery County’s land redevelopment initiative, Arc Environmental was retained to provide environmental consulting services during redevelopment of the former Washington Suburban Sanitary Commission (WSSC) ComPro facility located in Silver Spring, Maryland. The Site was historically used as a sand and gravel quarry between 1950 and 1980 and redeveloped in the mid 1980s by WSSC as a municipal waste composting facility. 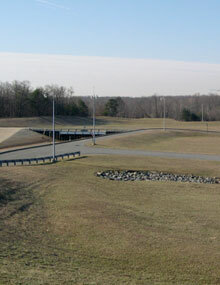 The facility accepted sewage sludge from the Blue Plains Waste Water Treatment Plant for processing into compost and topsoil. WSSC closed the facility in 1999 due to odor complaints from the surrounding area. Environmental issues at the Site include the former operation of underground storage tank systems and filling of quarried areas of the Site with rubble fill from unknown sources. In an effort to protect future occupants at the Site from these environmental issues, Montgomery County elected to enter the property into the Maryland Department of the Environment administered Voluntary Cleanup Program.